Gov. 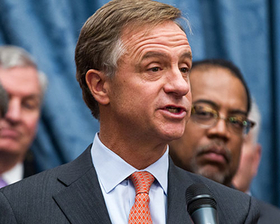 Bill Haslam's proposal to extend health coverage to 280,000 low-income Tennesseans has failed during a special legislative session after nearly two years of negotiating with federal officials. The Senate Health Committee defeated the Republican governor's Insure Tennessee plan on a 7-4 vote Wednesday. Even though lawmakers who voted against the plan said their decision was more policy-related than personal, the defeat was nonetheless a stinging rebuke to the governor, who breezed to re-election with 70 percent of the vote. He had toured the state touting the plan and opened the special session Monday evening with an impassioned plea for its passage. "I'm disappointed," Haslam told reporters after the vote. "We made a decision today, but we didn't do anything to answer the problem; and the problem is there're hundreds of thousands of Tennesseans who need health care." Haslam spent 21 months talking with federal officials for a special deal for Tennessee that included market-based elements such as vouchers to buy private insurance, co-pays and assurances that the state could pull out of the deal if it ended up being more expensive than expected. Hospitals pledged to cover the $74 million state share, meaning taxpayers wouldn't be on the hook for extra health insurance costs. Tennessee Hospital Association President and CEO Craig Becker said the group is "extremely disappointed" in the failed vote, but remain optimistic that lawmakers will continue to look for ways to help Tennesseans who need insurance. Haslam told reporters he's not sure what his next step will be. "We are hopeful that members of the General Assembly will continue to consider ways for Tennessee to provide coverage to the hundreds of thousands of uninsured in our state who have no option for coverage," Becker said in a statement. "Hospitals believe this is right for our state and will continue to work with the Haslam administration and General Assembly to find coverage solutions for Tennessee's uninsured." Opponents of the Insure Tennessee proposal objected to adding to the federal debt by having the state draw down $2.8 billion in federal money under President Barack Obama's health care law. Others said they don't trust the federal government to keep promises to allow Tennessee to withdraw from the plan. "Ultimately, the absence of a clear, written agreement between the federal government and the state of Tennessee made passage impossible," Sen. Speaker Ron Ramsey, R-Blountville, said in a statement. However, supporters of the plan said they were comfortable with the accountability measures the governor had included, and that the proposal is needed to help those Tennesseans in dire need of health coverage. Republican Sen. Kerry Roberts of Springfield said one of the reasons he voted against the measure is because he wanted to see more details about the consequences for the state if it pulled out of the plan. "This was a very agonizing decision for everyone on that committee," he said. Nurse practitioner Cathy Hill-McKinney of Troy said her conservative Republican beliefs had not influenced her support for the plan. She said a cancer patient she cared for — who couldn't afford treatment and eventually died — could have utilized the governor's plan. "I wish you would at least give it a shot," she said during testimony before the Senate Health Committee earlier in the day. "We've got an opportunity to do something really good." With the plan's failure in the Senate, it appeared unlikely that the House would move forward with its version of the proposal. "I think everybody heard from every side of this, and the members just weren't comfortable voting for it," said House Majority Leader Gerald McCormick, R-Chattanooga. Haslam and other supporters said one reason for the plan's failure was that opponents couldn't disassociate it from Obama and his health care law. "Those who oppose it associate everything with President Obama. That's what has killed this," said state Rep. Johnnie Turner, D-Memphis. Indiana last month became the 28th state to expand Medicaid under President Barack Obama's health care law, and the 10th initiated by a Republican governor.